UFC 173 officially has a new featured attraction. 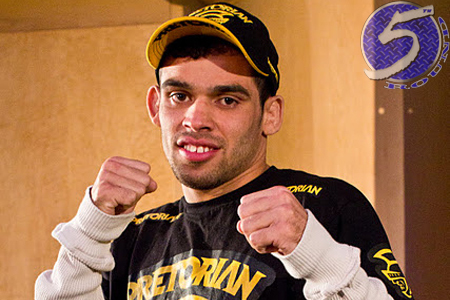 Bantamweight champion Renan Barao (pictured) will defend his crown against T.J. Dillashaw in the May 24 event. USAToday reported the matchup late Thursday night. The 135-pound affair replaces the middleweight title tilt between champ Chris Weidman and Lyoto Machida. Weidman was forced to withdraw earlier this week to undergo knee surgery. That tango was postponed to UFC 175. Barao hasn’t lost a scrap since his professional debut in 2005. The Brazilian has gone 32 (1 NC) since dropping a decision to Joao Paulo Rodrigues de Souza. He was last seen in February TKO’ing Urijah Faber at UFC 169. Dillashaw earns his title shot on the heels of January’s decision win over Mike Easton. The Team Alpha Male-trained fighter lost a split decision to Raphael Assuncao in his prior outing. Raphael Assuncao was under consideration to get the nod against Barao, but USAToday reports he is dealing with some lingering undisclosed injuries. Dillashaw was initially slotted to face Takeya Mizugaki at UFC 173. No word on who will now be Mizugaki’s new nemesis.